Our Volterra and San Gimignano shore excursion into Tuscany has been designed for our guests who have already visited the famous cities of Florence and Pisa, and are interested in exploring other beautiful areas of Tuscany rich in charm, history and culture. Your Stefano Rome Tours professional English speaking Driver will meet you at your ship 8:00 AM holding a sign bearing your name and bring you back at 5:00 PM. Your shore excursion to Volterra and San Gimignano will begin with a relaxing drive through mesmerizing countryside of Tuscany to your first destination, Volterra. Voterra is also one of Tuscany’s most evocative Medieval towns, rich in history, architecture, and famous for the beautifully crafted alabaster objects produced by local artisans that you will discover on your visit. Volterra stands as a walled hilltop town more than 500 meters above sea level. In the ancient times it was a significant Etruscan center named Velathri (“vel” is a considered a common Etruscan word for “hill”)...then the name eventually evolved to Volaterrae after it became an ancient Roman municipium. During the middle ages Volterra served as the bishop’s residence until it was overtaken by Florence and the Medici Family. You will have free time to enjoy the impressive Piazza dei Priori that’s surrounded by magnificent 13th and 14th century palaces and buildings. Palazzo dei Priori is the oldest town hall in Tuscany. Nearby is the Cathedral of Santa Maria Assunta. You can also find a vast variety of precious alabaster objects for keepsakes and gifts that are unique to this town in many of the shops and boutiques along the way. From here you will enjoy another delightful drive through the breathtaking countryside of Tuscany to San Gimignano. Upon approaching San Gimignano you will see by its defining skyline why it’s been called the Medieval Manhattan of Tuscany. Unlike most Italian medieval villages, San Gimignano is unique in that it managed to preserve about a dozen of its original 72 towers which have become the international symbol and pride of this remarkable Tuscan town. During the Middle Ages towers were a symbol of affluence and power, therefore many prestigious families competed in building the tallest and greatest towers to establish their relevance in the community. 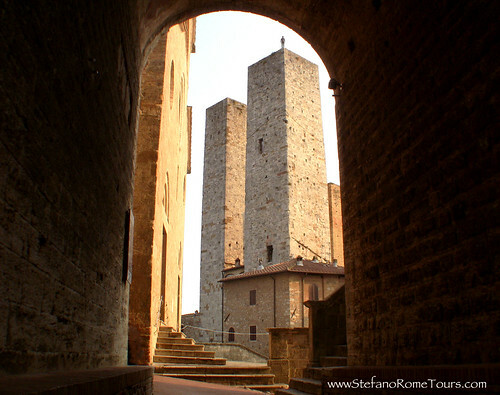 The historic center of San Gimignano is a UNESCO World Heritage Site. The town’s long history is fascinating, dating as far back into antiquity as 3rd century BC when it was settled by the early pre-Roman civilization known as the Etruscans. More contemporary documents record its beginning in the 10th century when it adopted the name of of the bishop of Modena, Saint Geminianus, who defended it from an attack by Attila the Hun. 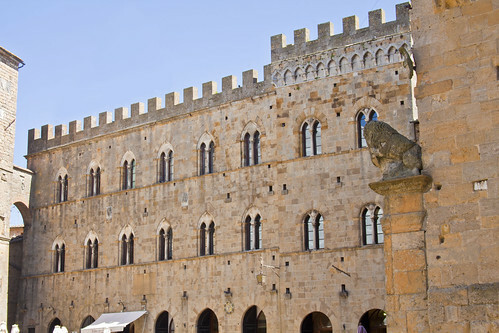 Here, you will have the opportunity to enjoy enjoy the popular triangular main square, Piazza della Cisterna, that showcases in its center a beautifully restored 14th century well that was once the main source of water for the residents. Surrounding the square is a diverse assembly of the finest examples of Renaissance and Gothic buildings and towers. Your driver will offer suggestions for lunch as there are many restaurants with varying tastes and budgets. Some of the best gelato in Tuscany can be found at the ice cream parlors in the square. From here you will enjoy another relaxing drive to your ship in Livorno. Thank you for choosing Stefano Rome Tours for your day tours and shore excursions in Italy. We look forward to meet you and to show you Tuscany! * The Tour Price for “Volterra and San Gimignano” includes an English speaking Driver with your own private deluxe vehicle, Italy VAT tax, fuel expense, insurance, applicable toll and parking fees. * The Tour Price for “Volterra and San Gimignano” does not include entrance fees to paid museums or monuments, lunch, gratuities, licensed tour guides hired separately, or any other personal guest expenses. * The Total Price for the shore excursion is per vehicle, not per person. Guests may share the cost of the tour among themselves. Save a lot on this Shore Excursion from Livorno by sharing your tour with like minded fellow cruisers for up to 8 guests per minivan. It is very simple: just place an ad on Cruise Critic's Roll Call with a link to this tour page and invite other cruisers to join your tour. Share the Fun and the Expense! According to Italian laws aimed at protecting the integrity of licensed tour guides, only Licensed Tour Guides may accompany guests away from the vehicle to sightsee. Your driver will be obliged to remain with the vehicle while you are sightseeing. * Your driver can offer recommendations for lunch, but if you have a preference please discuss with your driver first so he or she can make suggestions. * Payment for the tour will be made in Euro funds at the end of your journey, and paid directly to your Driver. You may also pay in full amount in advance via PayPal. Just let us know when your tour is confirmed if you wish to prepay. Don’t worry, we will not ask for your credit card information, request advance payments to reserve your tours, or penalize you with cancellation fees. We operate on the traditional Honor System, therefore we simply ask that all cancellations be made at least 7 days in advance so we can rebook your service and your reserved driver does not lose work for that day. Pompeii and Amalfi Coast from Naples cruise port.